The Sailing Yacht Research Foundation (SYRF) has received $100,000 in donations to support its mission to provide the science to understand the performance of sailing yachts through research and education. This milestone has in turn prompted SYRF’s receipt of another $100,000 in funds, thanks to a generous challenge grant established by an anonymous donor. 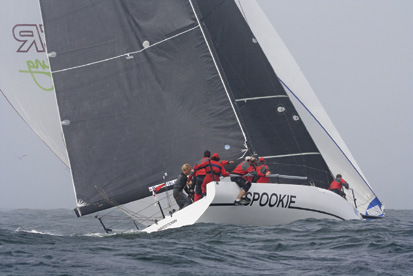 Heidi & Steve Benjamin’s HPR Carkeek 40 SPOOKIE (Norwalk, CT) exemplifies the high performance planing boats being developed under the auspices of the Sailing Yacht Research Foundation. SYRF is busy putting the funds to work. Data is being generated in their Wide Light Boat Project, a study that will characterize the performance of modern planing yachts. The structure of a new online data library to archive past research results is being designed, Technical Director Myles Cornwell gave a presentation on SYRF to the International Technical Committee meeting of the Offshore Racing Congress, and the second HPR (High Performance Rule) regatta of the 2014 season was held at Sperry Top-Sider Charleston Race Week in April. For more information, visit sailyachtresearch.org.